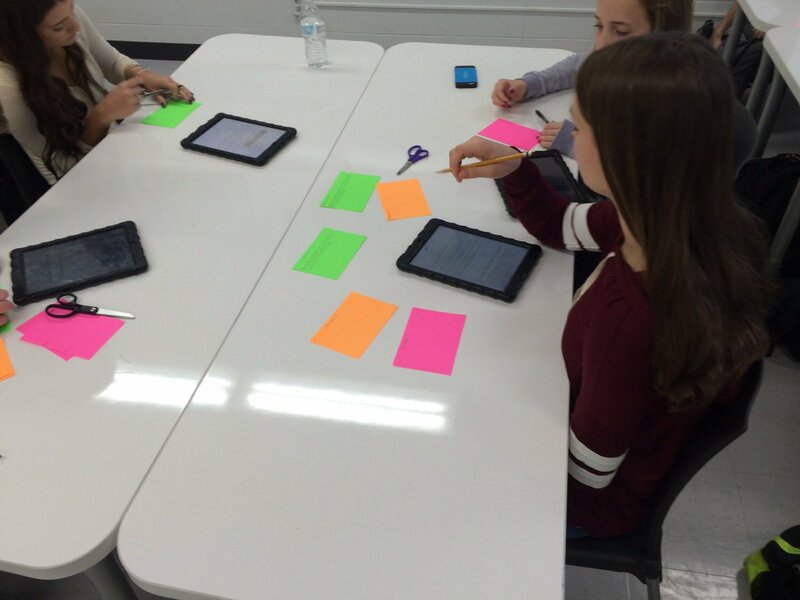 The Collab Blog: Get Students Writing! Modeling, Peer Collaboration, Argument Towers and More! Get Students Writing! Modeling, Peer Collaboration, Argument Towers and More! Your students need to synthesize information from varied sources--complex texts even--to defend a claim or hypothesis, make an argument, debate an issue, persuade or present a point of view. That is just the question that many teachers have been examining recently recently in the Collab Lab. Some recently scaffold Persicoped lessons from English and Social Science classrooms gave us some ideas. Then Google Hangouts conversations with some of our D214 colleagues gave us even more ideas! Becky Kinnee and Carrie Mattingly shared a valuable resource that included an "Argument Tower" strategy to scaffold the writing process and to help students "get it" as they synthesize information from multiple texts. You can check out the resource here: Building an Argument Tower (From the AP World History Blog by Jonathan Henderson). Let's see how Mark Heintz incorporated the strategy in his AP World History class in a series of week-long scaffolded steps to help his students prepare to write a document-based essay. How did people legitimize their rule between 1450 and 1750? Mingler Activity: Using key ideas from the upcoming documents, Mark created a "Find someone who . 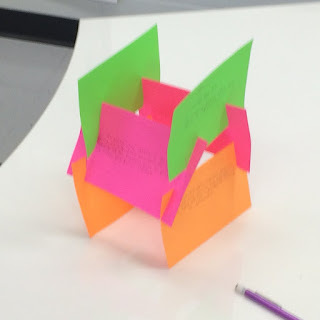 . . " activity that got students up and moving, connecting with peers, and using vocabulary and important words/concepts that they would encounter in the readings. Mark started with the first document with a think aloud and questioning with the whole class to help students interpret the key information and isolate evidence that supports the guiding question, or claim. 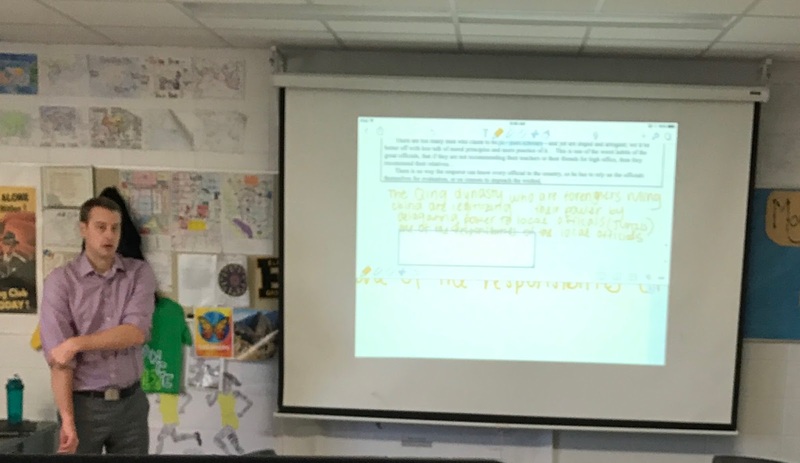 Students annotated their own document on their iPads while one student modeled the notetaking by mirroring her iPad on Apple TV. Following Mark's model with the first document, students worked through the second document with a partner. 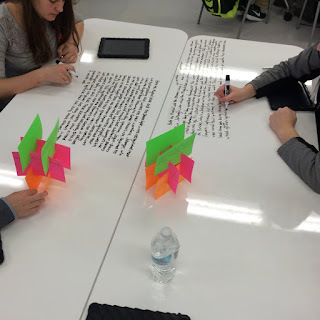 They helped each other interpret the document, write key evidence (in support of the guiding question) on the whiteboard tables, and make connections to the evidence from the first document. After writing their own responses, the pairs rotated to another table to give feedback to their peers. Students were guided to give meaningful feedback based on the DBQ criteria. Then they rotated back to their own tables to review the feedback and make revisions. 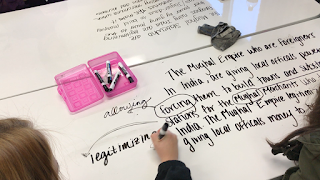 Following the steps in the Argument Tower resource, Mark guided the students to use colored index cards write to write and categorize their thesis, evidence and reasoning to organize their thoughts to write the introductory paragraph for their essay. This kind of scaffolding takes time, and Mark is continually reflecting and asking students for feedback on the process. He finds that in this student-centered approach, students are more engaged (he can hear it, and see it, as they work with their partners), and they demonstrate deeper understanding on both the content and the writing process as compared to a teacher-centered approach. In the student-centered process, students see more models, get ongoing feedback from teachers as well as peers, and they have multiple opportunities for revision. Students gain deeper understanding and confidence in the writing process, which better prepares them for second semester writing when the scaffolding will be gradually removed and students will write on their own. You talk about students writing. Thanks Linda for share this post with us. I have read this post and impressed about this lab. I again back your website for more another information. You can also check it about thesis revision. A community in which you can get the idea about the learning pattern in the better way. There is the helpful link present in this area which can bring the happiness around you. You can now connect, learn and share with the same place. Quite interesting article for students. 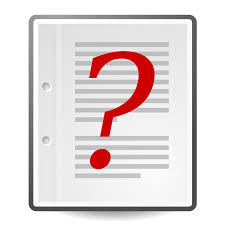 Students are often confused in how to write clinical psychology dissertation. I just wants to say don't be panic we are here for you. For further details go to website and enjoy your visit here. This is nice post, The obsession can evidently be utilizing current disclosures in addition to revelations that you simply visit https://www.graduatethesis.org/undergraduate-curriculum-vitae-writing-service/ site and progressed toward becoming with a specific end goal to show up at inside your non-open examinations to consolidate past examination. This post help and advice! Document incorporated this approach like the most popular decision concerning checking and incredibly comfortably developed. I will equally always present an effective power source for, so, who seek a fabulous job cover letter local building company. Good blog post, The issue with today life is we make the life of the present people an over the best measure of had and snappy. Today we don't tend to give time or to have any extra time just visit this page to release our self from a few issues. Awesome article. Student writing modeling is something that can help people in writing research paper and dissertation. You can check it here for many important peer.